If you love someone…don’t set them free…make these. If the worshiping of ”you” is what you crave…make these. If you are able to endure endless hours of merciless praise and wonderment from the love of your life…make these. Does your lover need a little nudge remembering you belong on a pedestal high up in the sky….make these…they will never forget about you and your special perch again. 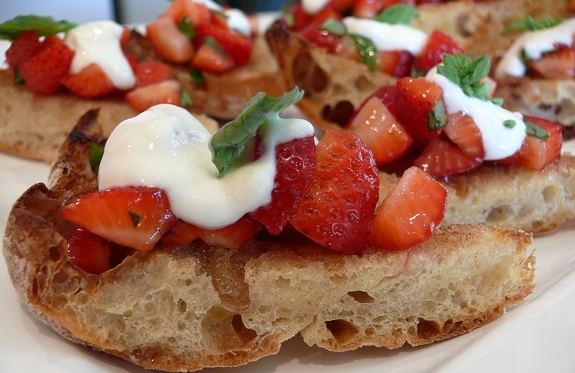 These Breakfast Bruschetta with Strawberries and Tangy Cream are the answer to all things bliss. Mornings are not always the easiest part of the day but these lovely twists on an Italian classic will help start your day off sweet. Now go place your crown on top of your head and get ready to take your rightful place as King or Queen of the kitchen and don’t forget your scepter too! 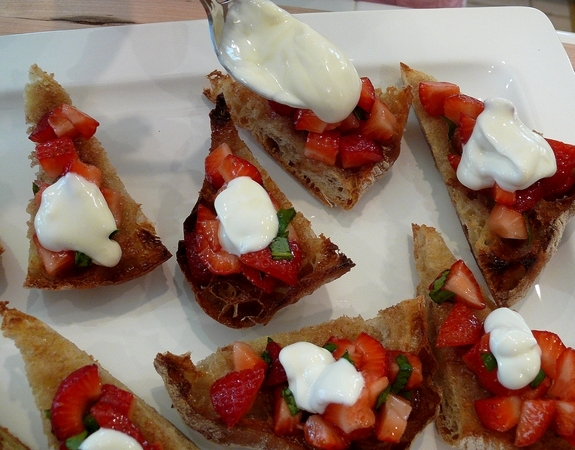 Here’s all you need to make these happen: Granulated sugar, ground cinnamon, ciabatta bread, fresh strawberries, fresh basil, fresh lemon juice, butter, sour cream, plain yogurt, honey and vanilla extract. Preheat broiler to HIGH with rack 6″ from the heating element. Combine 2 Tablespoons sugar and 1/2 teaspoon ground cinnamon in a dish. Cut ciabatta roll or loaf in half and cut into triangles. Generously butter each slice of bread. Sprinkle the cinnamon-sugar mixture on the buttered sides of the bread and broil on a baking sheet until toasted, about 2-3 minutes. 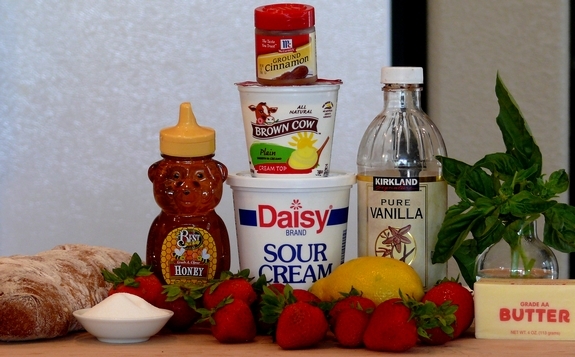 Stir 1/4 cup sour cream, 2 Tablespoons plain yogurt, 2 teaspoons honey and 1/4 teaspoon vanilla extract together in a bowl. Toss 1 cup of fresh, diced strawberries, 2 Tablespoons sugar, 1 Tablespoon fresh chopped basil and juice of 1/2 a lemon in a bowl. 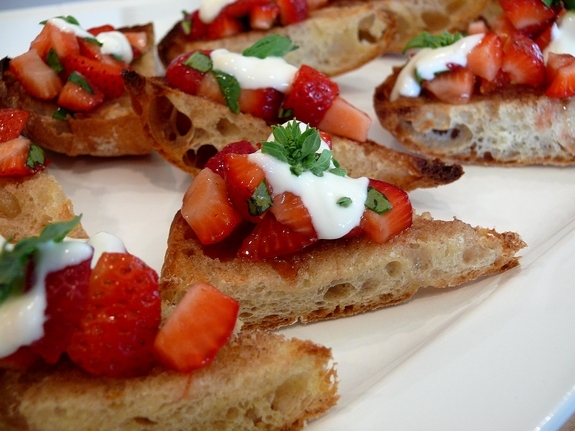 To assemble the bruschetta place 2 Tablespoons berries with juice on each piece of toast. Dollop with 1 teaspoon sour cream mixture. Add more basil for garnish. Can you really think of a better way to start your day? I didn’t think so. 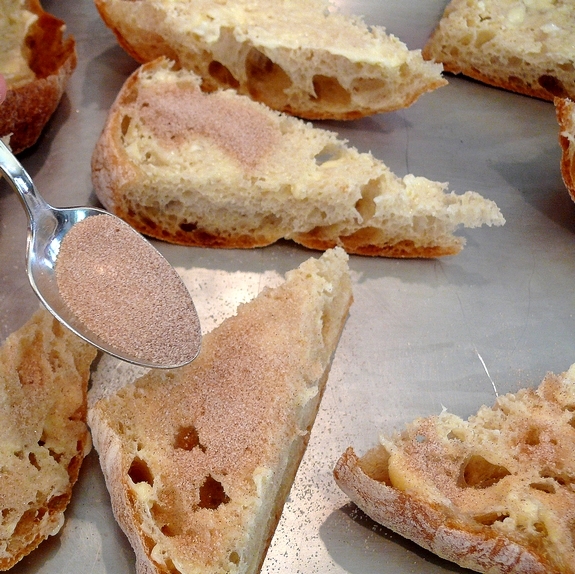 Combine sugar and cinnamon in a dish. Sprinkle mixture on buttered sides of bread, then broil on a baking sheet until toasted, 2-3 minutes. Toss strawberries with sugar, basil and lemon juice. 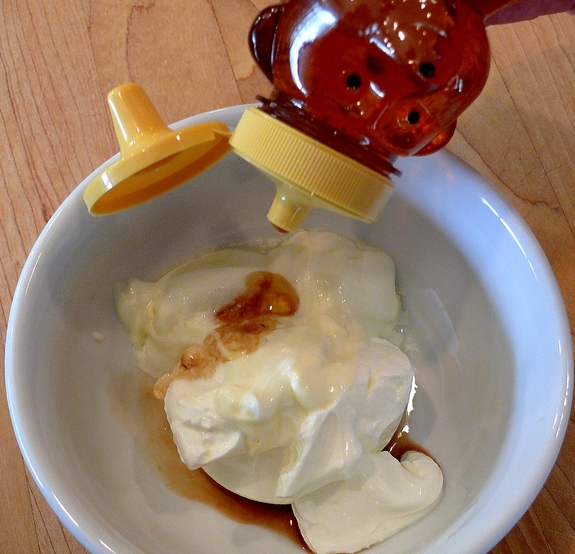 Stir sour cream, yogurt, honey and vanilla together in a separate bowl. To assemble bruschetta, spoon 2 Tablespoons berries with juice on each piece of toast; dollop with 1 teaspoon sour cream mixture. Don’t forget your entries for the Potato Ho-Down Roundup are due by July 14th so get them in! Wow, those Bruschette are original! I bet they are addictive! Delicious..
All I can say is YUMMM! This looks great – crunchy, sweet, and delicious! Passing the crown to you, as the ultimate Queen of the kitchen. I have no idea how you come up with these, but I’m so glad you do! 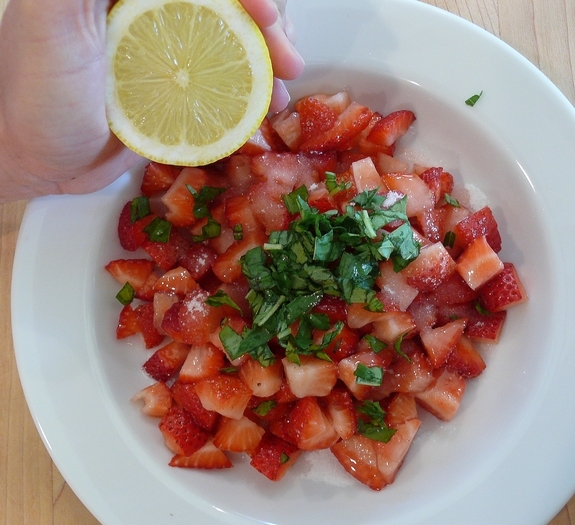 Strawberries and basil-salivating my way away from the computer…. YUM! I bet fresh mint in place of the basil would be great as well! I love to make Blackberry Almond Bruschetta from the Pilsburry website. So good! I thought they were tomatoes at first and was feeling queasy… Thank goodness they are strawberries! This looks awesome, Cathy. Now I’ll have to make it! Wish I had some right now!! They look delectable! Those look so perfect for a summer breakfast! The combo of strawberry and basil sounds incredible! This does look like a great way to start your day! What a clever idea! They look delicious! OH MY! Those look wonderful, and what a great idea! I wouldn’t have thought of taking bruschetta in this direction, but now the mind reels. Yum…..
Yum! You’ve done it again! Oh my lord! Those look so good. If I could only swallow, I’d be making them in a minute! Did you see that you made the Cupcakes Take The Cake blog for your Poprocks Cupcakes??? This makes me want to cry! I’m in the middle of moving now… still not done! Not till the end of next week! So I can’t wait till my kitchen is unpacked because I want to make these right away!!! YUMMMO! I miss yummy homecooked food…. your pictures make me sad (in a good way). Mmmm, I’ll have to try that! Anything with strawberries, that’s my motto! These little bruschetta look heavenly. I love the whole combination of ingredients. I need to try these today. What kind of camera do you have? Your pictures are always so clear and the food looks so good I want to eat my computer screen. I love your twist on the Italian classic. My daughter would love these! Delish and too pretty!! Goddess. That is all I have to say to you today. YOU. ARE. A. Goddess. Damn! Those look like they have no calories at all! Your photos are astoundingly delicious looking, Cathy. I just bought strawberries this morning at the farmer’s market… something in the universe was calling to me when I eyed the largest of the strawberry packages. I think it was this recipe!!! You have added to my ever growing group of receipes we have to try. omg.. my hubs is going to love these !!!! Wow! I would never have thought to couple strawberries and basil together… but I love both. Hmmmmmm… I might give this a whirl! Oh yum, there isn’t anything about those that doesn’t sound yummy! Oh stop! I’ve only gained about a gazillion pounds in the last month. This looks so good! mmm…cinnamon sugar. what’s this? you didn’t buy the pre-mixed cinnamon sugar from your grocer’s shelf? gasp! isn’t that the silliest thing you’ve ever seen? i pity anyone who can’t combine cinnamon and sugar themselves. I’ve had this very recipe in my to-try pile for ages! Glad to see it’s so good (and easy!) It seems like a great choice for a summery sort of breakfast treat. Awesome! I’m always looking for a good weekend breakfast that doesn’t take too much time to prepare. Will definitely try this. Pass the champagne. These go on my next brunch menu. I see you’re up to your usual tricks and it looks as scrumptious as ever. You have an award waiting for you over @ my place so drop by & pick it up sometime soon. I have done this on Sourdough with cream cheese and strawberries, but this looks yummy. I am addicted and you love it. Damn you. No way! Yu-hum!!! Cathy, these look incredible! Yum! This is so delicious-looking and a healthy way to start the day!!!! 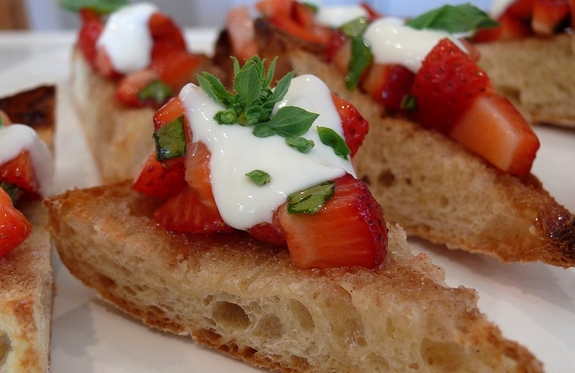 A sweet, breakfast bruschetta! Taking my favorite part of any meal and adding it to breakfast, perfect! I am officially going to go buy all the ingredients I don’t already have at home so I can make this for my family this weekend. I am so glad you post all the great recipes you do, you make me happy just coming here and drooling, which leads to …making me fat, lol! This is such an awesome idea! My mind is getting blown today by yummy breakfast dishes. Another awesome breakfast. I need to pay more attention to this meal–this is really creative and really tempting! Those breaksfast bruschetta look great!! A new way to love…and to be loved I might add :D. The idea of a sweet bruschetta is simply brilliant. I love the basil touch, makes it all sound even more interesting. These would be perfect for a brunch. So pretty! This looks like something my husband should make me just because. I think I will shove this under his nose. what a great idea! I bet it’d be great with other berries too: and it looks very festive! Gosh, I just love drooling over virtual goodies that I cannot eat. Specialists say that home loans aid people to live the way they want, just because they can feel free to buy necessary goods. Moreover, a lot of banks give small business loan for young and old people. One remembers that life seems to be high priced, nevertheless we require cash for different issues and not every person earns enough money. So to receive fast home loans or just bank loan will be a correct solution. Houses are not cheap and not everyone is able to buy it. However, loans are created to help people in such kind of hard situations. I received my first personal loans when I was 32 and it aided my family a lot. But, I require the student loan also.